Galaxy Ring, originally uploaded by antigenre. 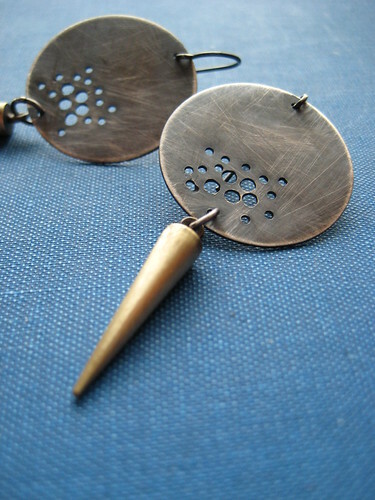 I had a pair of my Buckshot earrings that never sold sitting around in my inventory drawer for a long time. I decided to dismantle them and try something different, and this ring is the result! To me, it’s sort of a mod-yet-industrial cocktail ring of sorts. I have a brass prototype to keep for myself, but I think I want one in this (rather striking, if I may say so myself!!) blackened sterling silver. It’s currently available in my Etsy shop in sizes 7 and 8. In preparation for holiday shopping, I’ve decided to add a ‘Ready to Ship’ section to my shop. Any items that are already made and ready to go out the door will be listed here, so be sure to check there if you are getting started on your holiday shopping! I’ll add more pieces as I get them made. Earrings, originally uploaded by antigenre. I don’t have a name for these earrings yet, but they are part of a series of items that I’ve been playing around with. They will most likely appear at my first big craft show this weekend in Highland Park, NJ. I’ll see what the reaction to them is and make some more pairs of them to sell online. 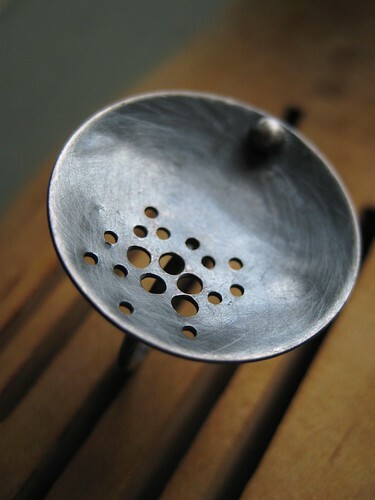 I liked the name ‘buckshot’ because of the random pattern of holes I drilled into the silver disc. It reminded me of stop signs on rural roads that have been shot up by bored teenagers with hunting rifles. I’ve also got some funky torpedo-shaped brass findings that I might use to sort of expand on the theme.